I worth-reading journal for all legal translators and interpreters. 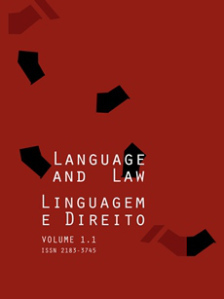 Language and Law / Linguagem e Direito is a new free, exclusively online peer-reviewed journal to be published twice a year. The Editors are Malcolm Coulthard, Universidade Federal de Santa Catarina, Brazil, and Rui Sousa-Silva, Universidade do Porto, Portugal. The International Editorial Board comprises an impressive list of names from the fields of forensic linguistics, legal translation and interpreting, and more generally language and law.